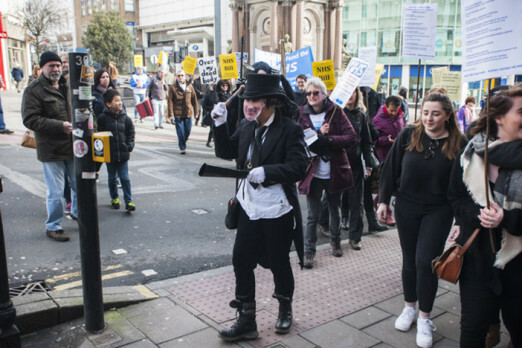 Armed with a scythe and a megaphone, the grim reaper led a funeral procession through Brighton on Saturday to the sound of a tolling bell and chanting protestors. 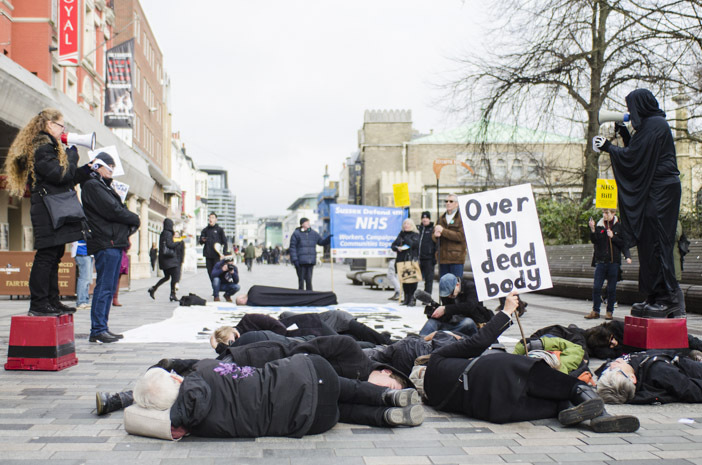 A group of black clad corpses lay in the road at various points along the route, from Churchill Square to London Road, to symbolise the imminent demise of the NHS and the very real threat to patients. 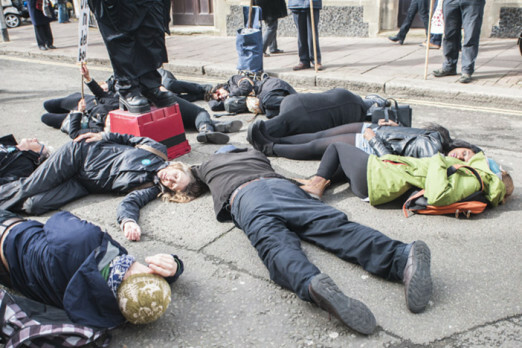 This ‘die-in’ was staged by the local branch of Defend The NHS, a campaign group opposing the underfunding and privatisation of healthcare. 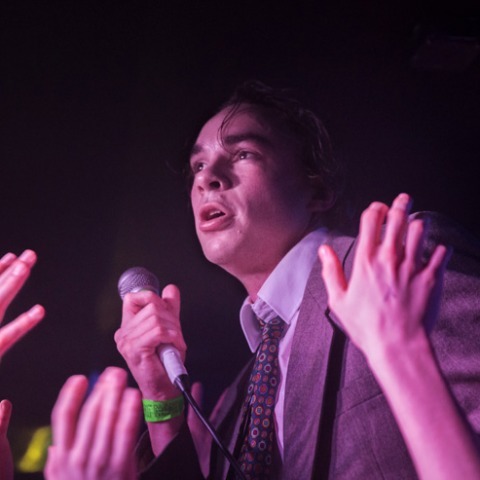 The event was a slightly am-dram affair (where are the performing arts students when you actually need them? ), but it got the point across well enough. 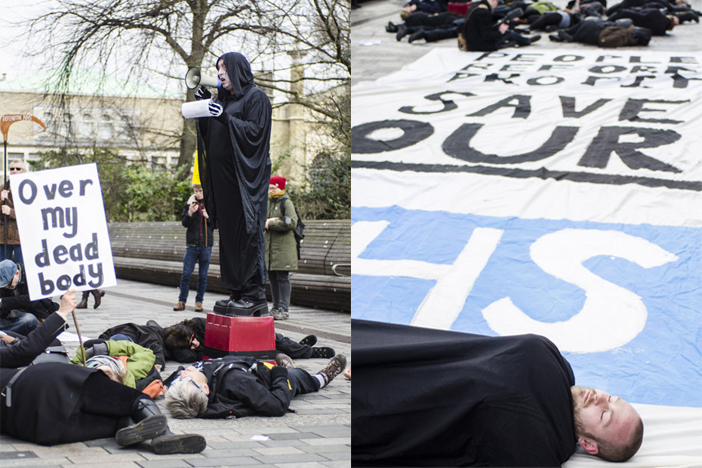 As ‘Doctor Death’ conversed with ‘Nurse Hero’ over the bodies of the fallen, passers-by heard how the dismantling of the health service is having immediate and pretty nasty consequences on a local level. Last year Brighton lost two GP surgeries; this June we’re set to lose five more. These five were tendered to a private company, ominously called ‘The Practice’, who are now pulling out of their contract because they haven’t made enough profit. (If that doesn’t make much sense to you, you’re not alone.) 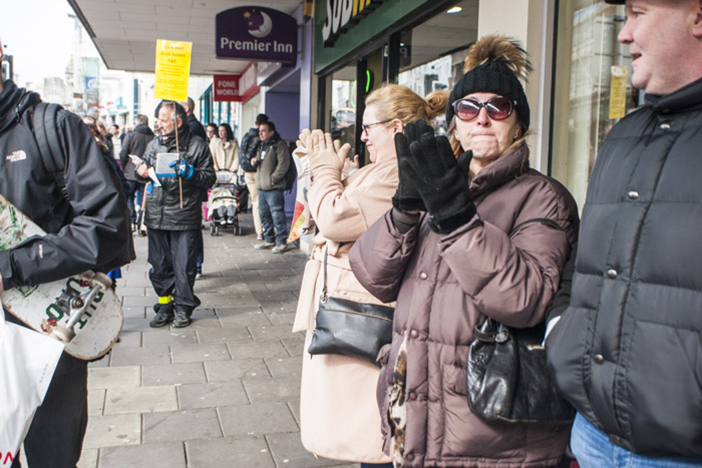 Most of the closures are in outlying areas such as Rottingdean, Whitehawk and Bevendean where there’s a higher proportion of elderly people who can’t readily travel further afield. And it’s not like the remaining city surgeries can accommodate thousands of new patients. There were 2,000 leaflets handed out on Saturday including a petition to save the Willows Surgery in Bevendean (which you can sign here). 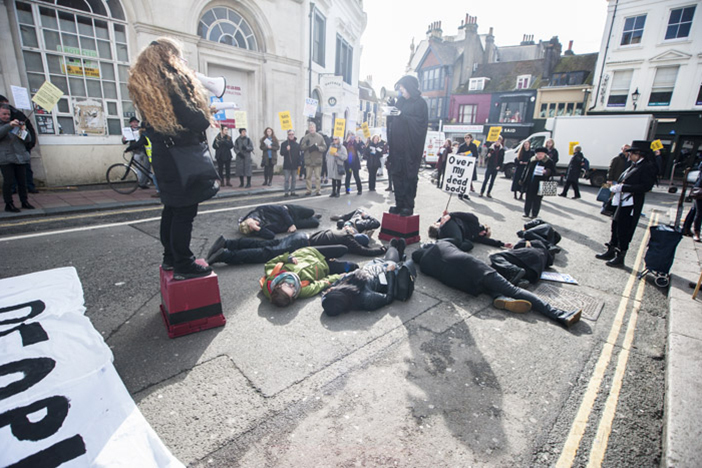 Despite the macabre theme of the stunt there was a positive atmosphere, with plenty of supportive cheers and beeps from bystanders and bus drivers (though there were tears on the cheeks of the woman who told us about the closures). 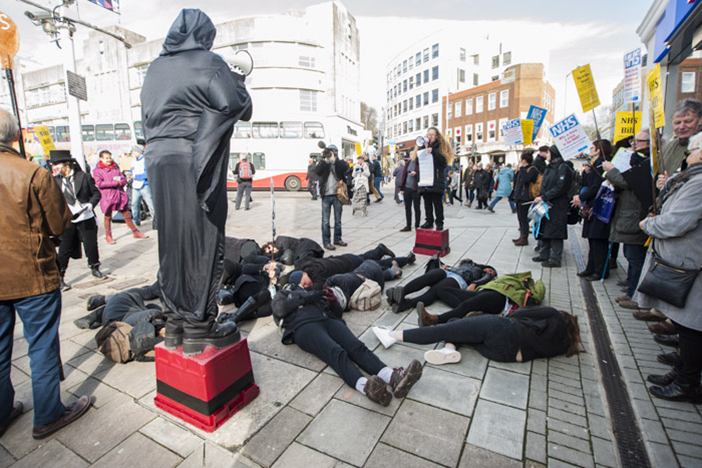 Last week Brighton University published a survey which found that 93% of local residents are concerned about private companies operating in the city and the same percentage wants proper consultation over contracts. By the way, did you know that a private company has taken over the running of Brighton’s patient ambulances? What happens if they decide to pull out? Some argue that privatisation doesn’t really matter as long as patients get the same level of care, free at the point of use. But it’s not that simple. Private companies don’t have the same regulations which means they can hit their own targets whilst still falling short of national standards (leaving already overworked NHS staff to compensate for their corner-cutting). Also, differing regulations tend to create a confusing and disjointed mishmash for healthcare as a whole. 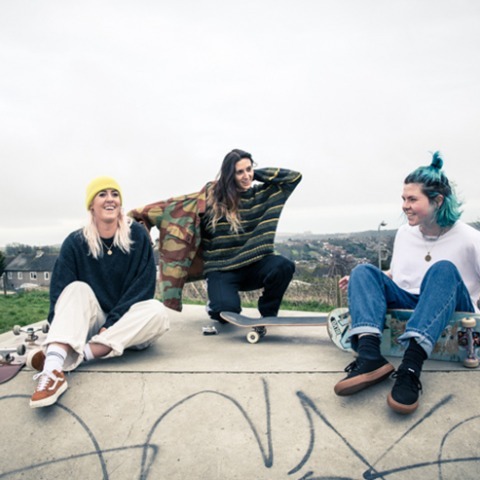 Besides all this, if The Practice can ditch their commitments and leave tens of thousands without a local GP, it would seem the argument is a nonstarter. Companies don’t offer the same level of care when they only care about profits. One student nurse, who wished to remain unnamed, told us that budget restraints are reinforcing the downward spiral in absurd ways. Apparently, the Royal Sussex is underfunded by £37 million. Hospitals can’t afford to employ enough nurses, but when it comes to the crunch they’re forced to hire agency workers to do the shifts they can’t leave unstaffed. And here’s the clincher: agency workers are paid up to three times more than regular nurses. This means more and more of them are inclined to sign up with agencies, leaving hospitals in a vicious financial circle. It’s a gutpunch to staff morale and it also eats away at the legal and personal ties that nurses have to their place of work, and ultimately, their patients. Of course, this process also undermines employment rights and union membership. This leads us on to the junior doctors, who went on full strike this year for the first time since 1975. A whopping 98% voted in favour of a walkout in response to Jeremy Hunt’s proposal to cut overtime wages (whilst narrowing the definition of what counts as overtime). Nevertheless, the Health Secretary took the risky and unprecedented decision to simply impose his terms, a move the union is seeking to prove is illegal. Rather than just taking it lying down, the junior doctors are planning another strike this week. 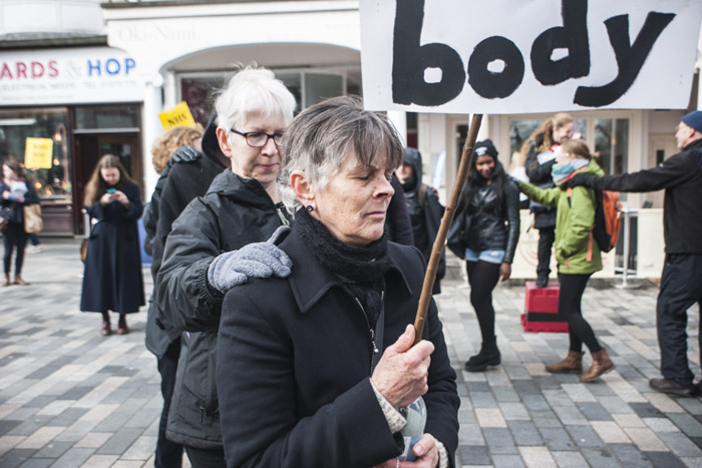 If you want to go show your support, you’ll find them outside Sussex County and Brighton General on Wednesday 9th and Thursday 10th of March. We hear there was a big crowd at the last strike, a very quaint choir and plenty of horn-happy motorists. 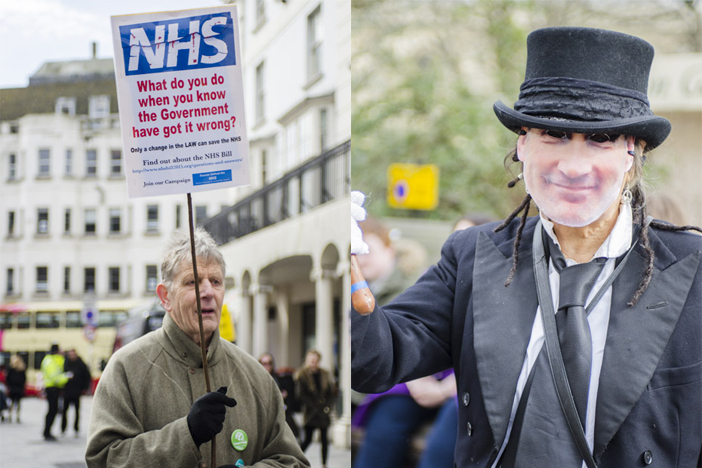 In many ways it seems the NHS is being driven into the ground in order to justify a sell-off. It certainly has the effect of forcing a crisis: the only thing that everyone agrees on now is that something big has to happen. Arguably the fate of the NHS will be decided this very month. 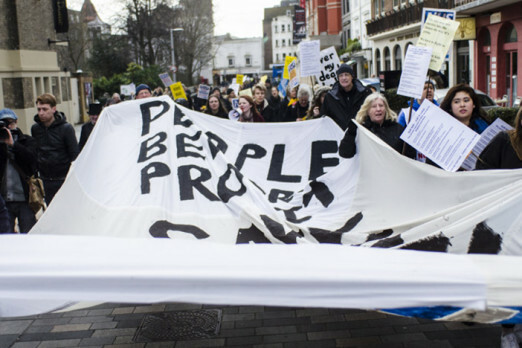 While further cuts are expected from George Osborne’s budget next week, there’s also hope in the form of the NHS Reinstatement Bill which is being discussed in parliament this very Friday (March 11th). Now on its second reading, this bill seeks to reverse the privatisation of the NHS, increase accountability and return it to public hands. 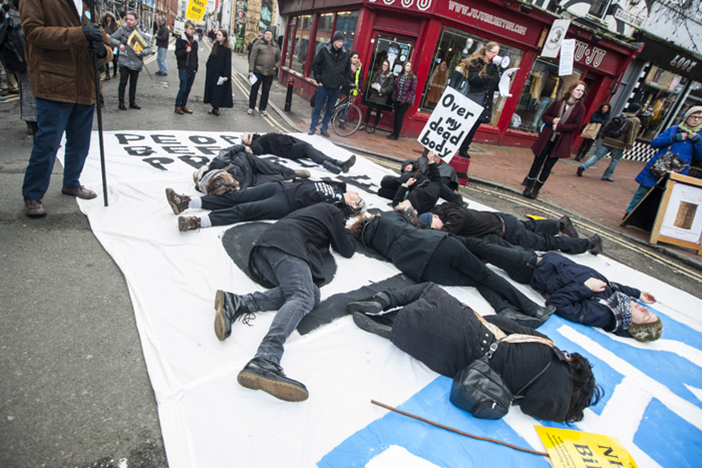 As usual, Brighton Pavilion residents can rest easy in the knowledge that their MP is on the case as it was Caroline Lucas who proposed the bill in the first place. 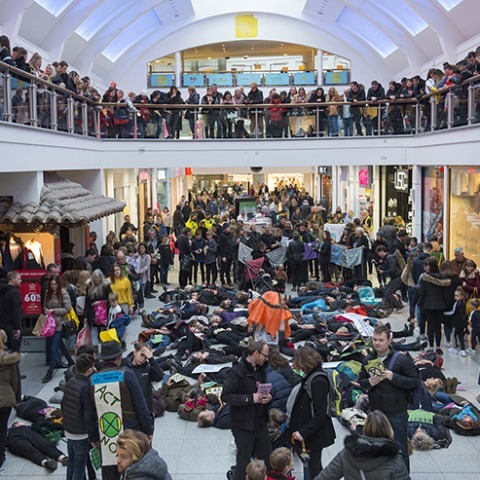 The same group who staged the die-in are gathering at the station on Friday morning to give Lucas a good send off when she catches the train to London (albeit with the dubious encouragement of a samba band). However, if you live in Hove or Portslade you might want to give Peter Kyle a polite/encouraging/angry email, as he’s yet to join the 70+ MPs who have pledged their support. There’s also a petition of course (here).